We offer San Francisco Boating Party Charters. Everything depends on your choice of boat. Some party boats have a Coast Guard-approved maximum of six passengers while others carry up to 49. These boats represent most people's interest and budget. Deluxe yachting parties can be much, much larger. Luxury yachts for very special events can make for the most memorable of celebrations from San Francisco honeymoons to VIP corporate charters. We will also coordinate two or more boats for a group fleet of party boats. Weekends, holidays and major events may cost more than typical weekdays. Some charge by the hour or per person; each boat is different. Per-trip costs are lower for a longer party. Multi day charters are available (depending on whatever). Go out in the ocean or stay in the bay for a little halibut fishing. Stop at different harbors; for instance, depart from Sausalito for a short sunset bay tour and then go into Fisherman's Wharf for cocktails or dinner - then go back out for fireworks on the Bay. Go whale watching out of Berkeley and be dropped off for a night in a Fisherman's Wharf hotel in San Francisco, and then be picked up for Fleet Week and the Blue Angels air show! You can generally expect to pay somewhere between $500 and $2,500 for our "casual boats" depending on capacity and duration. More formal yachts are available with tables, dance floors, bars with bartenders and restaurant-quality dining options; these typically begin at around $150 per person, give or take $25 depending on your food options. The entry level price is in the range of $4,000, with a high per-person cost for small groups; 50 guests or more start to make this a more cost-effective option. 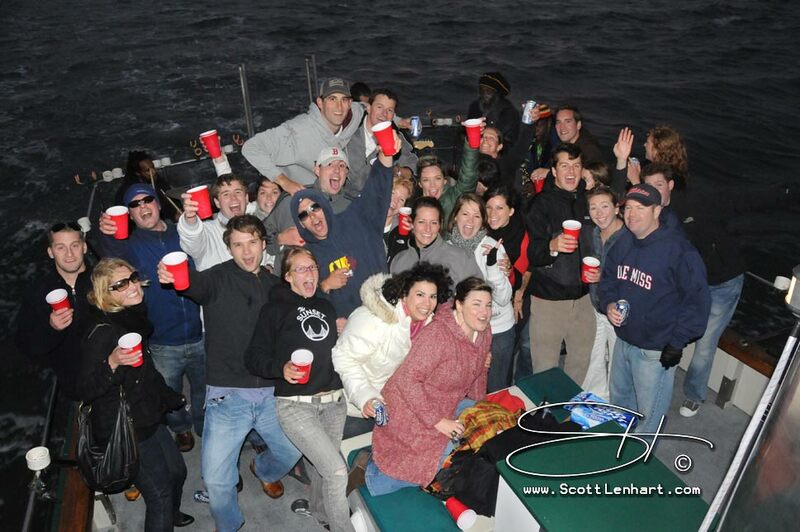 Our typical party boat charters accommodate up to 49 guests, last three or four hours and cost between $1,500 and $1,700. We depart for sunset cruises all year long. We also take parties out for the evening, returning as late as you like. Private charters for major holidays and events are in demand, and there are only 52 Fridays and Saturdays per year. If your special event or exact date is important, reserve as soon as you are ready. Many boats are reserved year after year by regular party hosts (such as for July 4th or Mavericks Invitational surf contest). Large casual boats offer a relaxed party more like a backyard patio party or tailgate party at a San Francisco 49ers football game. These are the most popular for birthday or bachelor/bachelorette parties since they have huge deck space - which is where most people want to be for a party on the bay. If you have a specific date requirement, you must lock it in well in advance. Otherwise you may have to settle for a different boat, date or cost. We have a great Reggae band that will play on the water. You can also have: a DJ, photographer, hostess, bartender or catering of any kind. Or bring your own. We don't provide alcohol but you are welcome to bring what you like. Any food or other preparation (such as a beer keg) should be managed before guests arrive. To be "green" about it, please use only paper cups and plates, and biodegradable forks, etc., whenever possible; this insures that anything ending up in the water is going to disappear within days rather than float around for decades. casual boat party on the Bay is the number 30 birthday! graduations, bachelor and bachelorette parties, and memorials. different way to have fun partying on a boat at sunset or 2am.